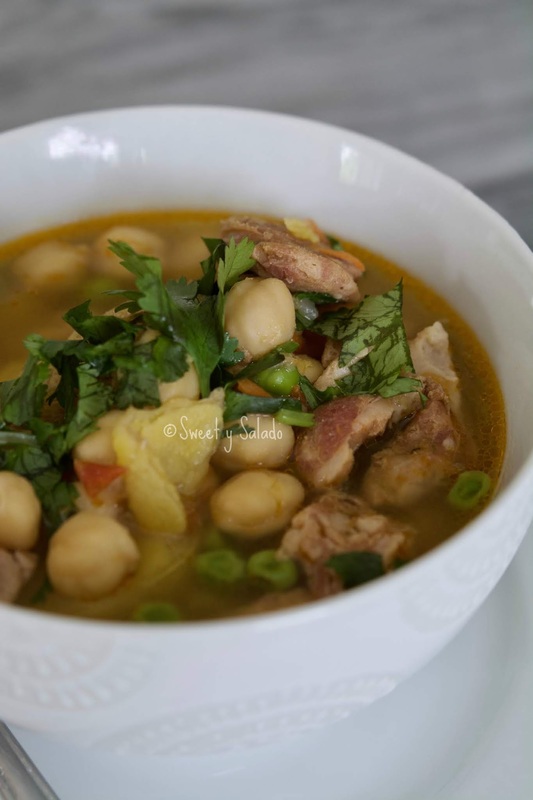 Today I bring to you my version of chickpea soup that so many of you have requested. And I say my version because it’s one of those recipes that I have been changing and adjusting since the first time I made it. 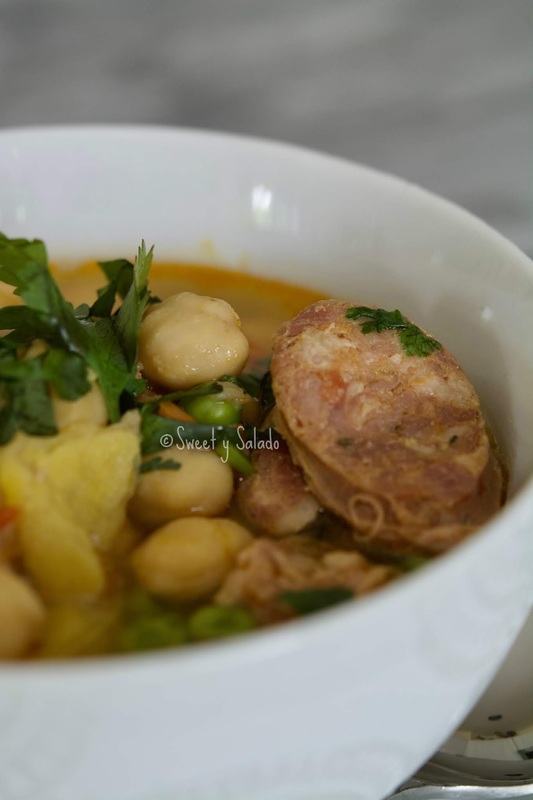 At first, I would only make it with chickpeas, then I added the Colombian sausage and then I ended up adding pork meat as well. I have also made it with tripe because it gives it a very similar taste to mondongo, but to be honest I prefer not to do it since the tripe that I find here in the US is not as clean as the one you can find in butcher shops in Colombia. I have tried different brands, different Latino butcher shops and I have not been able to find something that doesn’t have that very particular smell. If you know of a good brand that you like to use, please let me know in the comments below to see if that changes my mind. But anyway, if you decide to make this wonderful soup, make it with the ingredients you like most or take out the ingredients you like least, which is something I have always said in other recipes. 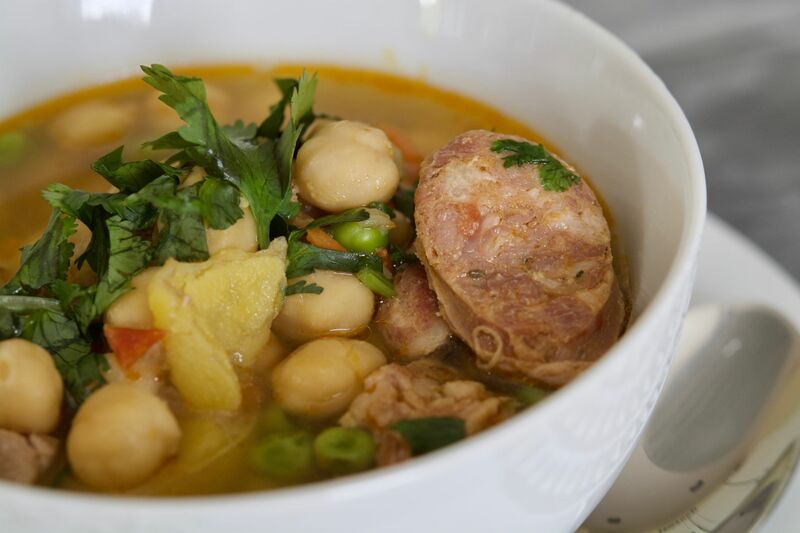 I have even made it with canned chickpeas to save time and it still comes out delicious. Leave the chickpeas soaking in plenty of water the night before and drain them the next day before you cook them. The next day heat the olive oil in a large pot or pressure cooker over medium heat. Add the white or yellow onion and cook for about 3 minutes or until it's translucent. Add the green onion and garlic and cook for another minute. Add the chopped tomatoes and cook for about 3-5 minutes or until they are soft. Now add the cumin and food coloring and stir well. Slowly add the water, then add the sausage, pork meat and chicken bouillons. Cover, bring to a boil over high heat, then reduce heat to medium low and cook for about 1½ hour. If you're using a pressure cooker, bring to pressure over high heat, then lower the heat to medium low and cook for about 45 minutes. 4. Uncover the pot, add the potatoes, sweet peas and grated carrot and cook for about 15-20 minutes or until the potatoes are cooked. Add more water if needed. If you're using frozen creole potatoes, they will be ready in less time since they are partially cooked. Season with salt and pepper to taste before serving. Garnish with cilantro and serve with white rice and avocado.